I would like to offer to you my very first design. 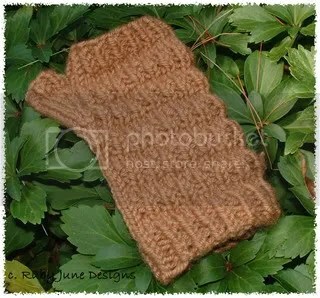 I made these fingerless mittens because I couldn’t find any that I liked. 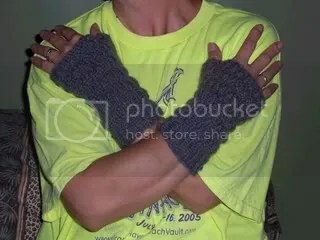 They are easy and knit up in no time. If you knit a pair let me know I’d really like to see them. I hope this is the first of many patterns for me. 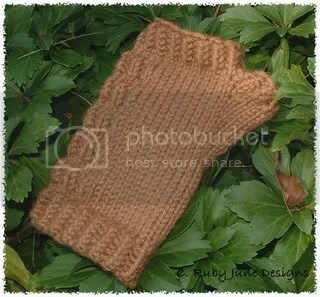 The perfect mitten to keep your hands and wrists warm while your fingers stay active. Begin at cuff. CO 32 sts. Join being careful not to twist stitches. Place marker, knit 6 rounds in 1×1 Twisted Rib pattern. Knit next 3 rnds as follows: Needle 1 – Knit all sts, Needles 2 and 3- k1, p1 to end of rnd. Repeat this pattern from * 2 more times. You should now have 3 ripples on your glove. Inc one st (kf&b) in the 1st 2 sts. (14 stitches on Needle 1) Knit to end of rnd. Next rnd: knit all sts on Needle 1, K1, P1 on Needles 2 and 3. Inc in the 1st st (k f&b), K2, inc in next st (k f&b) ,knit to end of Needle 1. (16 stitches on Needle 1) K1, P1 on Needles 2 and 3. Inc in 1st st (kf&b) k4, inc in next st (k f&b)(18 stitches on Needle 1), k to end of rnd. Place first 10 stitches from Needle 1 on stitch holder for thumb. Knit to end of round. On Needle 3, co 4sts using backward loop cast on method. You should have 12 sts on Needle 3, 10sts on Needle 1 and 10sts on Needle 2. Work 3 rnds in Twisted Rib Pattern. Bind off all sts loosely in pattern. Divide thumb sts from holder on 2 dpns. Attach yarn and pick up and knit 6 sts evenly around thumb opening. K2tog, k2, k2tog, knit to end of rnd. Work 2 rnds in Twisted Rib Pattern. Bind off loosely in pattern. Knit same as right hand until gusset. K10, inc, k4, inc )(18 stitches on Needle 1), k to end of rnd. K10, inc (kf&b), k6, inc (kf&b) (20 stitiches on Needle 1), k to end of rnd. K 1st 10 sts on needle 1, place next 10 sts on stitch holder. There should be 12 sts on needle 1, 10 on needle 2 and 10 on needle 3. Finish Thumb as on right hand. Weave in all loose end and enjoy your new mitts! This pattern is provided for personal use only. Items made from this pattern may not be sold for profit. Stores may not sell these patterns or give them away to customers without consent of the designer. Images and text may not be used on your own site. You may print one copy for personal use, However you may not redistribute the pattern in any way. Many Thanks goes to Kate Vasa and Ally Belser for their help with knitting my very first design. Also I can not take credit for the great pictures- they were taken by Kate Vasa and Ally B.